With the guidance of a professional staff all students work on both full-length plays as well as shorter productions for public performance. Our view is that students should have an experience of organizing all aspects of the production. Drama promotes a sense of confidence, coordination, cooperation and self-reliance. It also provides great enjoyment and pride in achievement and is enriching for mind, body and spirit. 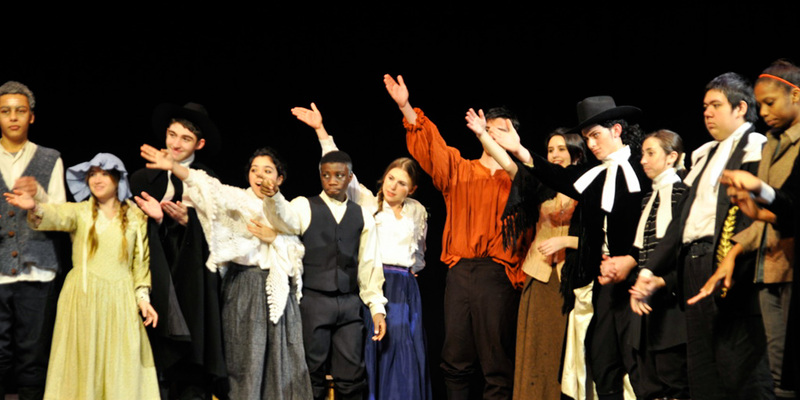 There are full scale required class productions in Grades 10 and 12, however, drama in the High School is often used to support other subjects across the curriculum. We pride ourselves in making drama accessible to all pupils regardless of talent, aptitude or enthusiasm. Our aim is to make lessons a challenging and rewarding experience and we hope to inspire in our pupils a lifelong interest in and love of drama and theatre. The school plays are frequently cited by pupils as a highlight of their years at the Waldorf School of Garden City; the tears and laughter experienced together in preparation and on stage are cherished moments many pupils remember for the rest of their lives.